If you’re looking for an alternative to a bread dough pizza base then you’ve come to the right place. However if you don’t like cauliflower then you haven’t. 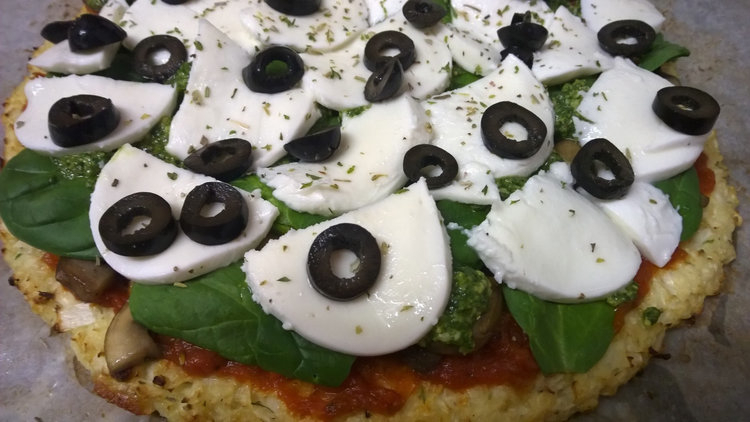 This pizza base uses no flour, just cauliflower, eggs, and cheese. Thank you to Jennifer at Coffee and Camera for alerting me to this recipe and thank you to Lavender and Lovage where she got the recipe from. Whatever pizza toppings you like! I used a homemade tomato sauce, sauteed mushrooms, baby spinach leaves, fresh pesto sauce, slices of mozzarella, black olives and a sprinkling of dried herbs. 1. Pre-heat oven to 210C/420F. 2. Grate the cauliflower to turn it into crumbs, then microwave it for 5 to 6 minutes (if you prefer you can steam or boil it, and then squeeze the excess water out). You want to end up with soft but quite dry crumbs. 3. Place the egg in a large mixing bowl, beat it lightly then add the grated mozzarella and parmesan, the cauliflower, the herbs, then season with salt and pepper to taste. Mix well. 4. Line a baking tray (or pizza stone if you have one) with greaseproof paper. 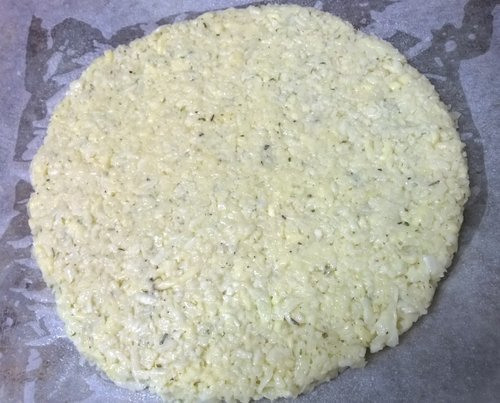 Tip the cauliflower mixture into the centre and press it down and out into a circle approximately 12-13cm wide, about 1.5cm high. 5. Spray a little cooking spray over the top and bake for 15 to 20 minutes until it is firm and starting to develop some colour. 7. Bake for a further 10 minutes or until it is melted and bubbling. Cut into wedges and serve. I loved this recipe and will definitely be making it again. Don’t expect this to have a chewy base like pizza dough usually does, and don’t expect to be able to pick up the slices in your hand, but do expect something tasty and satisfying that will fulfil your pizza urges in a lighter and healthier way (depending on your topping choices of course!). Good, hope you like it! Now that is a creative, healthy pizza! I know! 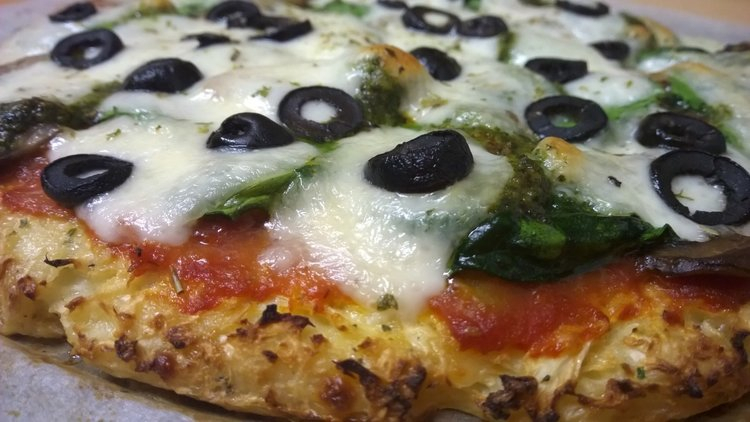 I often don’t like healthier versions of unhealthy food because they can feel like a compromise, trying to be something and failing, but this one didn’t feel like that, it just seemed like a different way to do pizza, and it was easy and fun to make too! I love cauliflower, so I’ll bet I would really like this! However, I don’t cook any longer! This is very interesting. I love pizza (who doesn’t? ), but I don’t eat it much because it’s not the healthiest choice. So using cauliflower as the basis for the crust is a cool idea. I’ll have to give it a try. Thanks for the idea! Yes, I was hoping you would see this (I know you’re away, or have been away so wasn’t sure if you’d see it) – I know you try to eat healthily as much as possible so I thought you’d like this one. 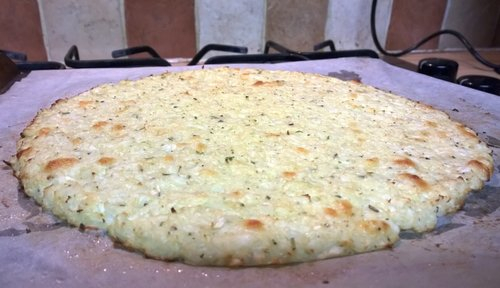 I really liked it – it wouldn’t quite satisfy the need if you felt like the comforting chew of a lovely pizza dough base, but it’s still really good! Yes, I’m away at a public health conference. Even more incentive to eat well! Hope you like it if you try it! I was fascinated with the idea when I saw it too, and tried it that very night! I must buy a cauliflower. They’ve been so expensive lately. In CAD $3.47 and not always white as they should be. Hmm. I just remembered. I haven’t seen the colored cauliflower around for quite a while. Wonder if that was a fad or what? Cauliflower seems to be very variable in price over here, particularly in the supermarkets, more so than other veg I think – sometimes it seems really expensive and other times quite reasonable. Luckily I have a few farm shops around me and they’re usually cheap and good quality there. I haven’t seen coloured cauliflower either for a while I don’t think. I bought a cauliflower today. Yep $3.47. Highway robbery. We haven’t had good prices on this vegetable at all this year. Usually in the fall when the veg is plentiful, we used to. The cheapest I paid this year is $1.79. Ugh. I love your take on it, and thanks for the shout out. I can’t wait to make it again now. Thanks Jennifer, great recipe, I can’t wait to make it again too! Oh oh—looks like I’m the first commenter who’s not a cauliflower fan. 😦 But this is certainly a novel take on pizza and probably much healthier than the typical American versions. Well we can’t all like the same thing! I bet this would work with some other vegetables too, maybe parsnip which is also white of course – I think the colour is important so that it at least looks like a dough base! But Vanessa, you’re missing out the most important thing…. what does it taste like? Can you actually taste or smell the cauliflower? Or would you need some strongly flavoured toppings to cancel it out? Ah yes, good point. You can taste the cauliflower, so I definitely wouldn’t recommend it to someone who doesn’t like cauliflower, but it’s quite mild so if you have some fairly robust flavours in the topping (like I did with the home made pesto, and an intensely flavoured tomato sauce), then that is what becomes predominant, and the cauliflower taste is more in the background.